The mutterings when Porsche revealed its new turbocharged Carrera last year, while numerous, largely covered two topics: was Porsche spitting on naturally aspirated tradition with its first ever turbocharged Carrera, and where did this leave the Porsche 911 Turbo, capital T? Could there really be room in the line-up for both? For Porsche, it was a resounding ‘yes.’ The Carrera after all had more than half a century of heritage to avoid shivving in the stomach with such a radical departure from tradition. 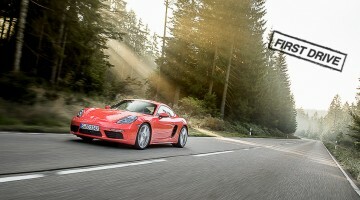 And yet turbocharging a downsized 3-litre flat-six was always going to be the next logical step for a company with an eye squarely on reducing fuel consumption and whose green technology forms a significant part of its long-term production plan, despite the multitude of gnashed teeth from 911 purists. The Turbo meanwhile was a different story. Though it too boasted four decades of history, stepping away from tradition was out of the question for a model whose DNA was so entrenched in ‘power’: that Turbo character was derived during the mid-to-late 1980s by a sea of red braces and filo faxes piling into lampposts, after all. Consequently, and unsurprisingly, you could park a Fiesta ST comfortably in the gulf between the 414bhp Carrera S and the new 572bhp Turbo S.
So, it’s quite nippy then? Quite. The performance figures are similarly neck-snapping: the top-spec Turbo S demolishes 0-100kph in 2.9 seconds, and – according to Porsche, unofficially – is capable of topping even that ‘under the right conditions’. Top speed is 320kph for the 533bhp Turbo we’re testing today and 330kph for the Turbo S – the fastest ever for a Porsche 911 – while the S’ 7m 18s lap time of the Nürburgring is NINE seconds faster than the outgoing model. Oh, and two seconds faster than the track-focused GT3 RS. Performance figures alone suggest the Turbo is not suffering a crisis of character in the wake of the Carrera’s arrival. That, plus the fleeting changes to 991.2. How big are the changes from old Turbo to new? Chances are you won’t even notice then when you first put your foot down. 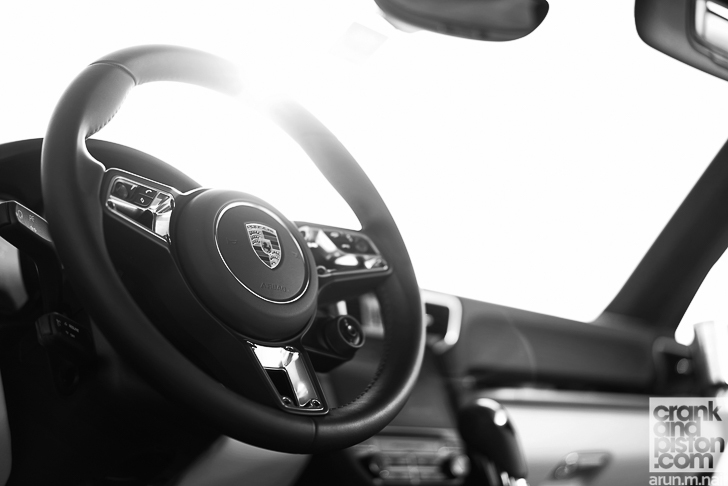 As always, shifts through the seven-speed transmission are seamless and sprightly, leaving us to wonder where exactly Porsche goes from here: the mapping is so well judged that even using the paddles feel like sacrilege. It’s through the corners though that the Turbo proves genuinely astonishing. Granted our Turbo base model has neither the ceramic brakes and adaptive suspension that come as standard on the Turbo S – which does put that near-$29K price gap into perspective – but the balance is so malleable, that even with an armful of opposite lock, the Turbo is impressively controllable. A combination of clever four-wheel drive technology and super grippy Pirelli P Zero rubber means that grip and traction mid-corner are beyond reproach: there’s no mid-engined spikiness to contend with, and even if somehow the back steps out, plant the throttle and Porsche Stability Management loads up the front axle to restore balance. You’ll have to really drive outside your talent window to unsettle the Turbo. So…yeah…don’t do that. 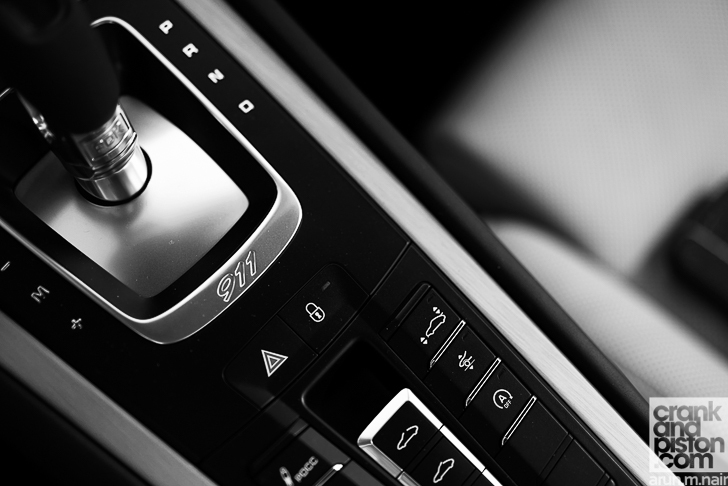 The steering, though electronically assisted, is beautifully damped, allowing you to flick the nose from corner to corner and really load up the front end with plenty of textured feedback being relayed through the steering column. A measurable sensation of speed mean those ventilated discs are truly put to the test into the slower corners, with no sense of fatigue it must be said. It’s through the high speed turns though that you can begin to hustle: there’s no lean – let’s not be ridiculous – and there’s little to unsettle the superb mid-corner lateral grip, allowing you to slowly feed the power in and feel that front end bite. I admit it sound mechanical and dis-engaging, but it really isn’t. Like its outgoing predecessor, it’s a combination that just encourages you to push, like a prized boxer offering you the first right hook. You’ll never send him to the canvas. And that does make me wonder how both the Audi R8 V10 Plus and the McLaren 570S will fare against its established rival. 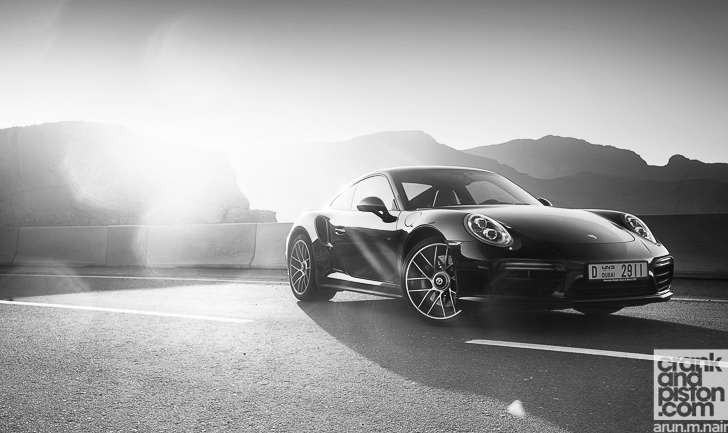 Enjoy our Porsche 991.2 Turbo test drive?